The second day of the Honolulu Festival started off with a beautiful and pleasant morning. 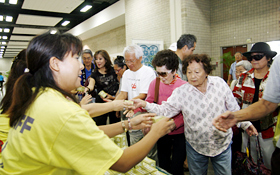 This day was open to the public and 4 venues including the Hawaii Convention Center, Ala Moana Center, Waikiki Beach Walk and Waikiki Shopping Plaza were flourishing with people. 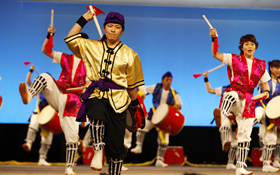 There were various performances taking place at each venue by the participating groups from the countries of the Asia-Pacific region including Japan and Hawaii. Also, there were a lot of guests since the admission was free. First come first serve! The guests are receiving a figurine of the Chinese Zodiac animal sign of the year. 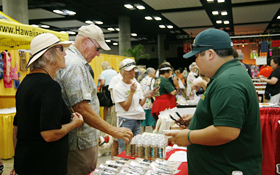 In addition, you can’t miss the lottery drawing held at the Hawaii Convention Center. The winner will receive the 2 day hotel voucher of the Fairmont Orchid, which is a luxury resort in the Big Island. There were many applicants in which there was a scene where they shared tables to fill out the form in a crowded space. 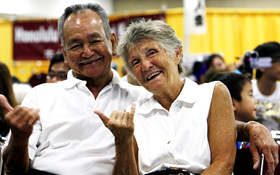 Meanwhile, the traditional Japanese musical instruments such as tashishogoto (Nagoya harp) and shamisen were being performed on the main stage of the Hawaii Convention Center, where many of the audience have gathered to watch the show. Many have gathered especially during the drumming performances, which caught people’s attention because the drumming sound was resonating inside the venue. One large group called Charles Morimoto Families from Wakayama Prefecture, Japan, showed a vigorous performance of the Eisa dance playing their Okinawan drums, which intrigued a lot of people and the place became crowded. 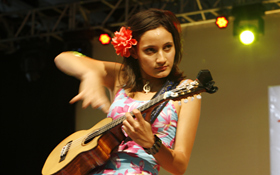 Furthermore, Taimane Gardner appeared on stage representing as a Hawaiian musician. During her performance, there was a microphone problem which the sound was interrupted. She said the apologetic Japanese word “Sumimasen (sorry)” in a clumsy manner, which the audience applaud and cheered. Afterwards, her performance was resume and the audience were even more excited. Taimane Gardner showed such a godlike technique. The sound of the drums by Charles Morimoto Families resonate throughout your body. 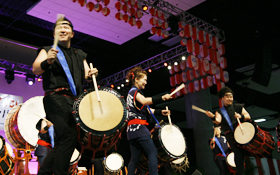 The taiko drumming performance by Kaze-Damari has a power to energize the listeners. You can see many happy faces such as this couple at the venue. 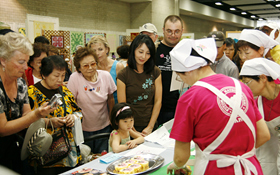 There were various displays and booths of Hawaiian quilts, Japanese crafts and locally made products across the main stage. Also, there were hands-on experience including the flower arrangement and picture letter, which they occupied more than half of the area. Also, there was the Anime Corner located along with the Maid Cafe and games, which became a hot spot for the young generation. As usual, the Maid Cafe was run by the students from the University of Hawaii which was flourishing that the guests had to wait in line. 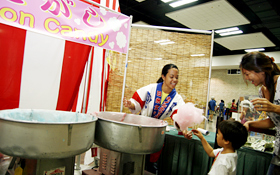 Furthermore, there were arrays of traditional Japanese festival booths by the Ennichi Corner such as the goldfish scooping, yo-yo fishing, shooting gallery and cotton candy. There were many family visitors. Also, there were several scenes where the child chases a goldfish with the poi (catcher) and their parents have lent the hands. Eventually, the child ended up watching their parents playing the game instead. 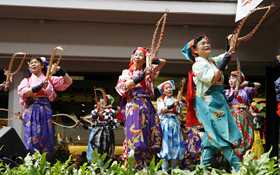 It can be said that the Ennichi is a tradition of Japanese culture which both adults and children can enjoy together. 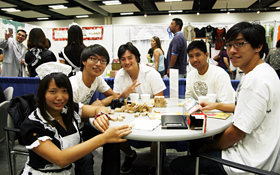 This year, a lot of guests were waiting by the Hawaii Convention Center from early morning compared to previous years. The atmosphere of the venue was energetic which was filled with traditions of Japanese festival. The members of Chiba Dentokyodoryori Kenkyukai demonstrated how to make futomaki (thick sushi roll). 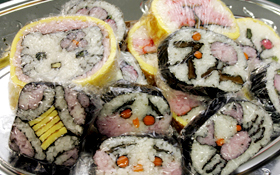 Everybody was amazed by the prepared futomaki. 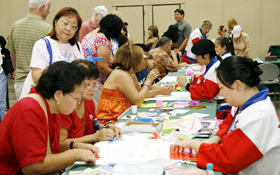 The origami (paper-folding) was popular among adults than expected which they looked serious. The booth of the tourist bureau promoting Philippines. 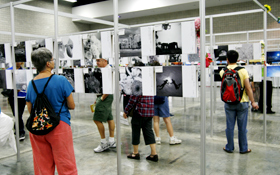 This is the art exhibition, where the combinations of haiku (Japanese poetry) and pictures were being displayed. The locally made product is popular as a souvenir. 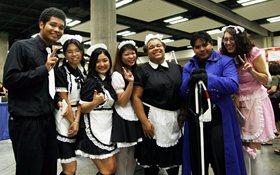 They are the members of the Maid Cafe with their customers that were wearing costumes. You can play the Jenga with a maid. The Ennichi Corner is a place for both adults and children to enjoy. The blue and pink cotton candies were the same as Japan. There were many audience including the tourists that were enjoying shopping and the locals by the stage of the Ala Moana Center located near the Hawaii Convention Center. They made the atmosphere lively this year as well. 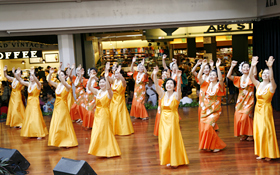 In addition, there were many hula performances compared to other venues. Every member of the hula dancing groups from Japan looked genuinely enjoying performing on stage. In addition, those lively expressions and wonderful smiles of the performers made the audience feel happy. Furthermore, their vivid colored dresses were illuminated by the bright sunlight from sky, which the audience greatly enjoyed watching them. The members of the Anela Hula Studio from Tokyo participated for the first time and they have been practicing their best for this day. They looked relieved after their performance which was memorable. Also, they said that the cultural exchange is the reason for their participation instead of being competitive like in the hula competition. 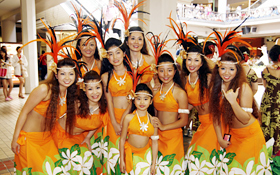 The members of the Anela Hula Studio participated for the first time. 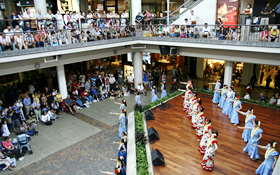 The Ala Moana Center was packed with audience. The members of Japan Nankin Tamasudare Association performed the Japanese traditional arts with their colorful dress. The members of Pikake Leilani Hula Halau danced with great enjoyment.